It's been a busy June for me (as always when it comes to work). I've been on a semi-hiatus from the hobby....but not quite like last year. I've dipped my toes into the pool a few times, mostly only to take them out after a couple minutes. No deep end dives (although the thought had crossed my mind on one occasion). I've also had a few cards come in. Some with very important meaning and representation in my collections. I'm looking forward to sharing those later on this summer when things calm down at work next month. What June has brought me though is a couple of very significant milestones. 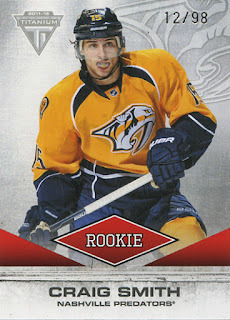 First, this is post #1000 of My Hockey Card Obsession. In a little less than 6 years, I've pumped out more posts than I ever imagined I would. I've looked back on some of them over the past few months and get a kick out of what I wrote. I still very much enjoy blogging and find it a stabilizing cog in my hobby world. I started this blog for me, for my collections and for the thought that I would build and improve both my writing and enjoyment of sports cards. I can say with 100% certainty that this is the case. Thanks to everyone who has taken the time to stop by and read my ramblings. I hope you have enjoyed my journey and will continue to do so in the future. Why not celebrate this historic post by announcing the completion of a long outstanding project. That's right........'1 vs. 100' is complete. The final card arrived today. This Patrick Roy /14 has a terrific story behind it (I love cards with stories). I was at a local trade night a couple months back and noticed this card in one of the trade boxes held by a regular at the store. I knew immediately the importance of the serial number. Of course, the player name had me a little concerned. But me being me, I asked if there was a trade that might be worked out. A quick sift through my old, stagnant and generally boring trade box yielded nothing. He then proceeded to say "for futures". Uh.......no. While I really appreciated the gesture (he knew the project that card would be going to), I knew that a Patrick Roy /14 was not a low-dollar parallel. He insisted......and so did I. I knew that the card would be in his trade box next month. Who knows what might happen. So a month passes and I go to the next trade night. Topps Archives Baseball had just been released and my other guy, Oscar Gamble, has a couple autograph cards in the mix. So I bought a couple packs just for kicks. What did I find but a gold Harold Baines signature /50. A pretty sweet pull considering I just grabbed a couple packs (the card is a 1:190 packs find). 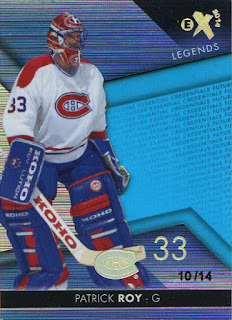 Before I even had a chance to really let sink in what I had pulled, what comes across the counter but a Patrick Roy /14. Now I won't say no to that trade. Thanks Art! A couple guys asked me what the final card on the list was. Can you believe "98"????!!!!!!!! Seriously? I went home that night and dug through ebay a bit to see what I could find. Craig Smith Titanium Rookie /98 is the answer to the question. Nothing really out of the ordinary about this card. It wasn't a wallet burner by any means. A simple parallel (and a higher numbered one at that) that had just snuck by me for a half-decade. Well, It's in my hands now and so are the other 99 card in the project. I've really enjoyed putting this "set" together. It's taught me that you can build anything you want in this hobby. It doesn't have to be expensive or shiny or rare or eight-color. It can be a simple idea - with a little creative spark - that can bring fun and challenge to collecting. I've already got ideas about what I'm going to do next. I think the quest will begin this fall. Stay tuned. CONGRATS! An amazing project to complete. Congratulations! That was a very fun project to watch come together and it's great you finally made it. Any chance of future "upgrades"? Don't see doing any upgrades unless someone wants to trade (which I've done in the past). If I have a /4 or a /7 I'm happy to part with it for a card of equal serial number (within reason obviously). Congrats on the finish. What's the chance of seeing all 100 cards scanned to a blog post? Good call. I'll have to build a full sheet to show. funny story, the Friday night after that trade night I was killing time online, and I found a couple of cards I wanted ending auction. the seller had that Craig Smith card as well. SO here we go. If I win my cards, I will pick up the Smith too. I didn't win my cards. Congrats on the 1vs100, its been nice watching this project go from start to finish. It really is one of the coolest collecting projects I've seen online. Congrats on the 1000 posts too! Looking forward to those next updates. That's quite the accomplishment. You'll have to showcase it on this blog one day. Congrats. Congrats! Finally reaching an end to a project is such a great feeling, especially one that takes years to complete. Good job sticking with it! Congratulations! How are you going to display this project? Binder? Can't wait to hear about your next project. Just toploaders right now. I'm not much of a "display" guy. I love the idea of creating your own "set". Congrats on the collection completion and the 1000th post!